We've come to the end of another 365 days of Matt The List (on Feb 23rd) that saw me reach over 400 new food & drink stops across 5 countries. I haven't written as often as I would have liked, but photography has taken over somewhat, and if the popularity of Instagram is anything to go by, people don't read anymore anyway. Is anyone even reading this? Hi Dad. For what it's worth, I've eaten some rather delicious things of late from all corners of London's international, eclectic dining scene. Let's start off in Haggerston. It takes something special to get me out of South West London for brunch. Something like Berber & Q, Josh Katz's magnificent Middle Eastern barbecue mecca in Haggerston. 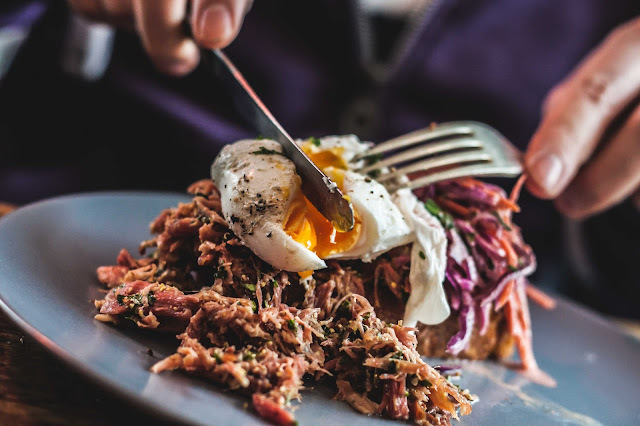 Now, you should go along for the full dinner experience so that you can gorge on cauliflower shawarma to your heart's content, but as it's one of those no reservations jobbies, brunch is a less stressful option. Walking in at 12pm on a Sunday, our group of three was seated instantly, with room to spare. The must order dish is The Full Israeli (for 2) - a seemingly endless tray of warm pitta, hummus, squash tahini, honeyed feta, Israeli salad, boiled eggs, avocado, tahini with za'atar, roasted beets, mixed olives, and two dessert pots of yoghurt & date syrup, plus Cay tea or Turkish coffee. It's £12.50 per person, entirely vegetarian, and worth every penny! Another veggie winner is the the Daily Pita (£8.50)- a traditional Israeli sabich with aubergine, pickled red onion, tahini, zhoug and herbs. In fact, Berber & Q brunch is a mostly meat-free affair, though in a couple of cases (The Turkish Eggs and the Green Shakshuka) sucuk sausage can be added. Our third and final plate was the Chicken Sofrito Hash (£9.50), a smartly seasoned tin pan of chicken thighs, fried eggs, potato, swede, carrot, and rosemary. It was comforting and moreish, but severely lacking in chicken - there was crispy skin galore though if that's your thing. All in all, it was a super brunch - well worth the epic journey on our beloved orange line. If you like the look of it, you should also add The Good Egg and Street Kitchen London Fields in the same part of town to your to-do list. 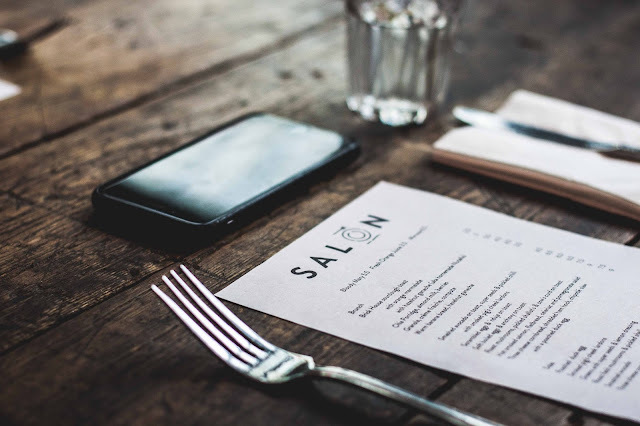 There are worse ways to start the week than with an indulgent three course lunch at Galley, Islington's seafood-centric new eatery from Marcel Grzyb (head chef at Randall & Aubin for 10 years) and stylist sister Oriana Robb. Small and large plates can be translated as starters and mains, or you can go down a sharing route if you wish. Dad The List and I did a little of both and started off with three rather fine entrées. In all three cases, the meat and fish were beautifully and subtly enhanced by the accompanying ingredients. Another restaurant might bungle such busy plates but here everything worked, from the soupy carrot and cardamom purée, to the beef jelly flavour bombs. 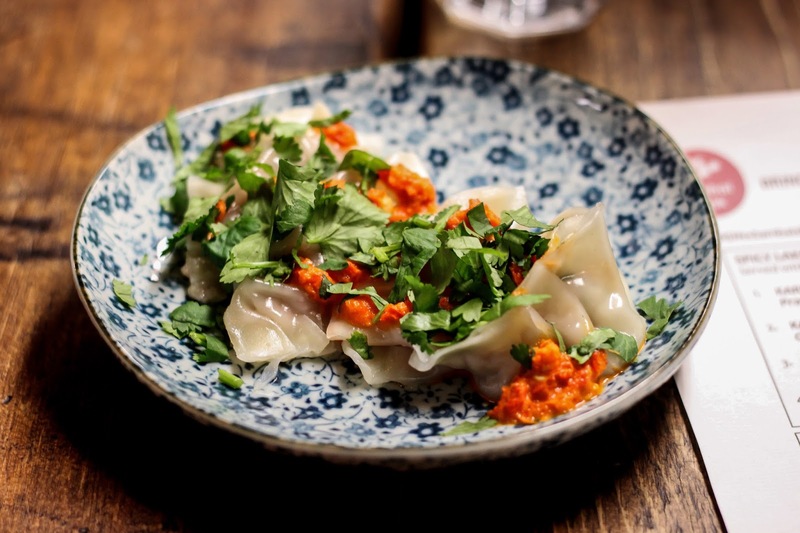 Nine more promising small plates lie in wait for a return visit. An equally long list of mains forced us in to more tough decisions, but we soldiered on. Lobster Pappardelle with heritage tomatoes and Jerusalem artichoke (£19) was superbly seasoned and executed. I would order it again and again without a second look at the menu. Most of the lobster was already out and about but you are left to do a little excavation yourself before you tuck in. Elsewhere, Pan-fried Sea Bass with gnocchi, peas, courgettes, wild mushrooms, and truffle oil (£19.50) received the thumbs up from Dad The List in between spoonfuls. One of my father's only conditions for eating out is that the dessert menu is up to scratch. Galley seriously delivered with two fabulous finales. The Lavender & Raspberry Crème Brûlée was pleasantly light, and the lavender came through well without overpowering the raspberry. Then came the Salted Caramel Tart, an outrageous calorific monster served with green tea ice cream, chilli & hazelnut. Serious stuff, as you can see below. 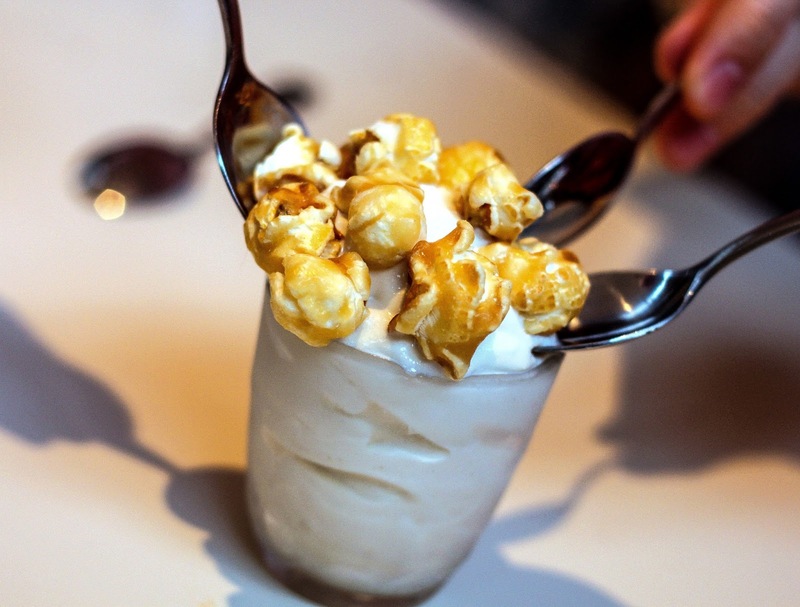 Alternatively, you could go down a more alcoholic route with one of their Dessert Cocktails - Coco Popping with coco pops-infused Buffalo Trace bourbon, chocolate bitters and double cream sounds like a winner to me. We rolled back on to Upper Street and attempted to salvage what was left of the day. There are better value meals to be had in the area (Oldroyd and Black Axe Mangal spring to mind), but if you want to splash out a little (hah! ), Galley is the perfect place to drop anchor. 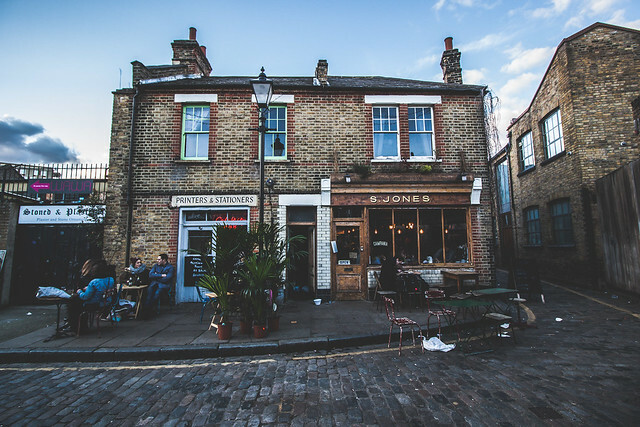 Campania & Jones is a charming Italian café and restaurant just off Columbia Road with an enticing menu and a magical, rustic atmosphere. The gnocchi with 'nduja was just what the doctor ordered - think more private healthcare than NHS at their prices though. 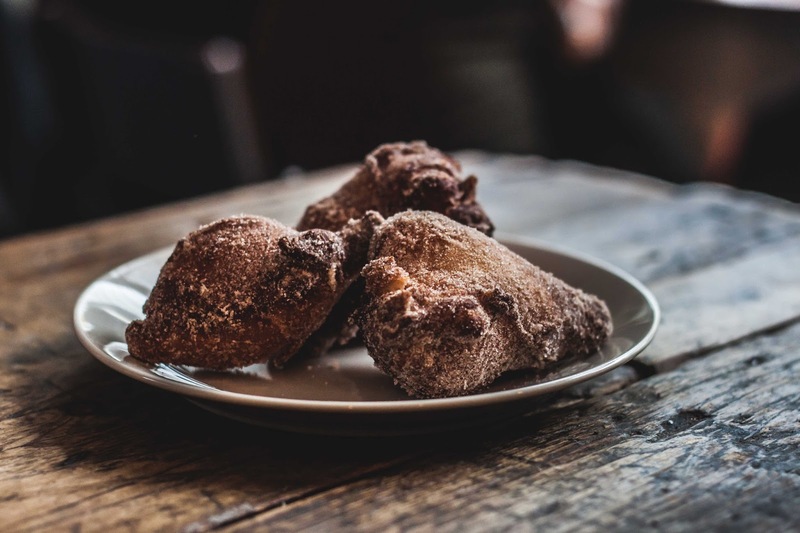 Lengthen your stay in the area with a trip to Lily Vanilli Bakery (Sundays only), Sager & Wilde, and Birdcage, and return for meals at Brawn and The Marksman. Carousel is known for it's rotating residencies in the evening (hence the name), but don't forget about their lunch offering. 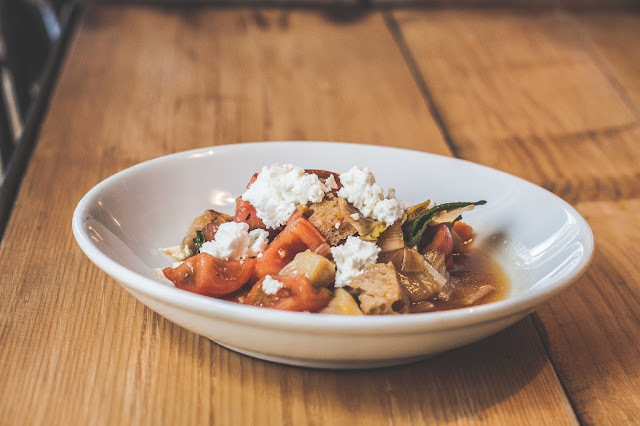 From 12pm-3pm, Tuesday-Saturday, the regular kitchen team headed up by Ollie Templeton serve up "Lunch by Carousel", a smart selection of seasonal dishes at ridiculously low prices. A salad of raf tomatoes, calcots, feta and bread was super fresh and a steal at £4, whilst a generous portion of grilled onglet steak, with salt baked potatoes and aioli, should surely have cost more than £10.50. There were several more hits (see full Flickr album here) including a heart-stopping dessert of cream-filled churros with dulce de leche and dried raspberries, not to mention the magnificent complimentary bread and oil. Outstanding from start to finish. One of my favourite openings of last year now has the Mum The List seal of approval too. 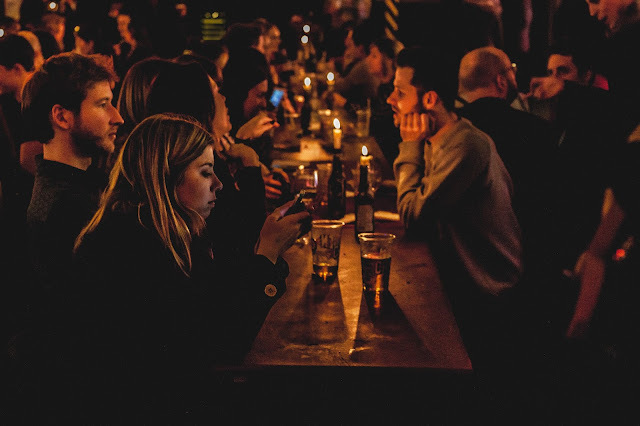 Head over at opening time on a Saturday (12pm) to get yourself a prime seat in Donostia Social Club's shipping container conversion in Pop Brixton. 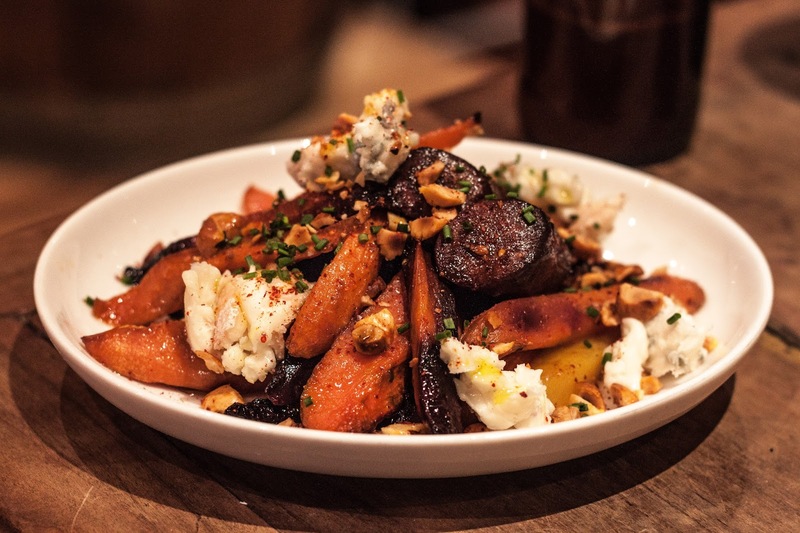 Super specials on our visit included membrillo glazed duck with carrot purée, and a warm salad of beets, goat's cheese and walnut. Across the way, Kricket have just launched a Sunday brunch menu including a goan sausage roll that has been doing the instarounds. 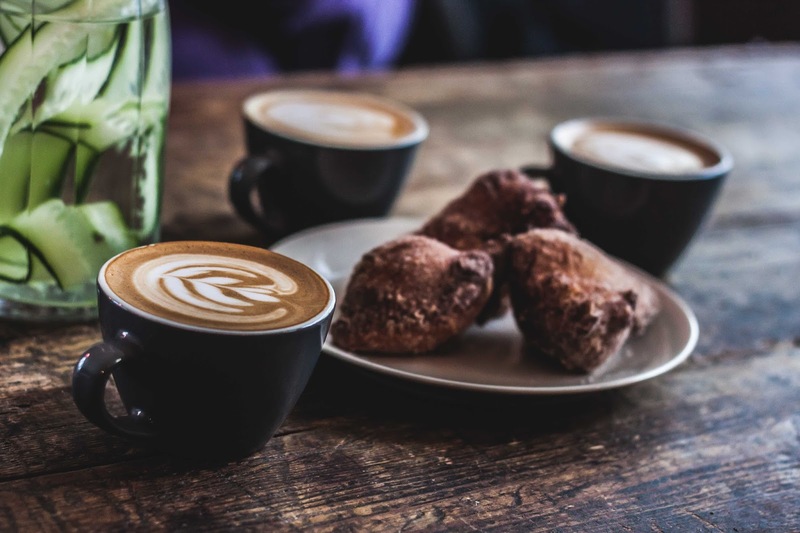 If you want a post lunch beverage in Pop Brixton, head to Brixton Port Authority, a remarkably well-stocked and cosy container on the ground floor. 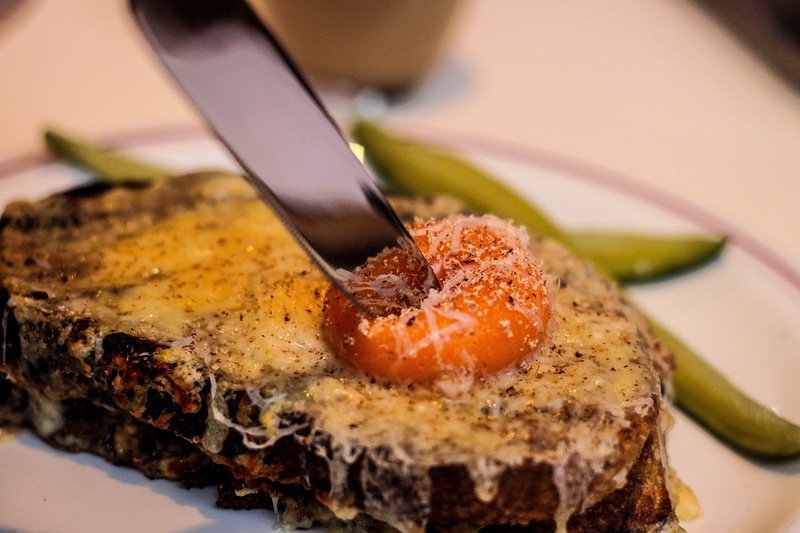 Soif is part of a wonderful group of bistros and wine bars that also boasts Terroirs (Charing Cross), Toast E.D. (Dulwich), and to some extent, Brawn (Hoxton). 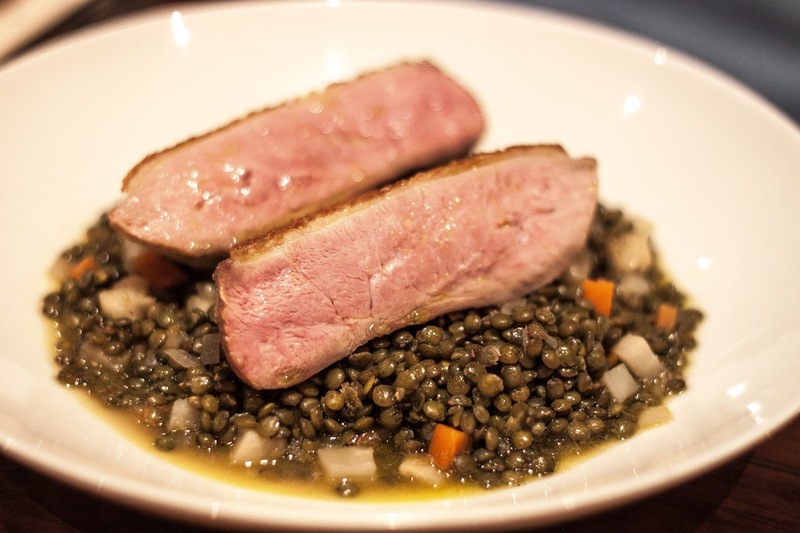 Highlights from a recent meal included a salad of roasted carrots, gorgonzola and spiced hazelnuts, a generous main of duck breast with braised lentils, and a magnificent crémet nantais (on its way to being cheesecake) with yorkshire rhubarb and pistachios. To drink nearby, you've got more wine if you need it at The Humble Grape, craft beers at Brewdog, and cocktails at King of Ladies Man and Southsider. Former Masterchef winner Tim Anderson finally opened Nanban, a Japanese soul food joint in Brixton, towards the end of 2015 after building up a loyal following at various popups, residencies and street food markets. 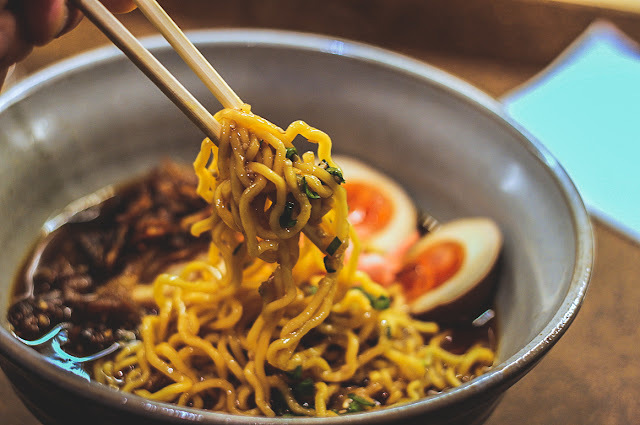 You can't go wrong with the ramen - from the curry goat tsukemen with seafood sawdust, to the miyazaki ramen with "yuzu-kosho schmaltz". It's hard to imagine ordering a noodle soup-less main, but I have heard good things about the sasebo burger with tea egg mayo and gochujang burger sauce. We also devoured several enjoyable small plates - the standout was Yaki-Imo, a baked sweet potato with ponzu butter and black sesame salt. 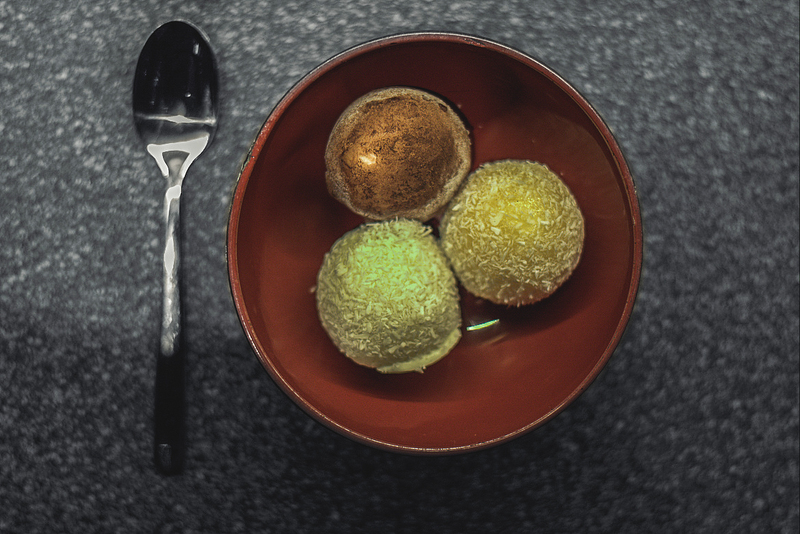 Finish off with Japanese Mr.Whippy, or a trio of refreshing, eye-catching mochi ice balls. Just down the road, Sovereign Loss and Three Eight Four are both top options for cocktails, and Unit Sixteen and Seven at Brixton are also worth a look when Market Row is open. Despite being slap bang in the middle of Soho, secluded St.Anne's Court is not the ideal spot to open a bar / restaurant on account of the surprising lack of footfall. Goodman's highly rated fish foray Rex & Mariano found this out the hard way, but they moved quickly and came up with Zelman Meats in its place. And it's a runaway hit. There's no printed menu, they just cook a load of meat, offer it to you by weight, and throw in a few enticing sides like black truffle and parmesan chips, or roasted cauliflower with paprika, cumin, hummus, black sesame and pomegranate. 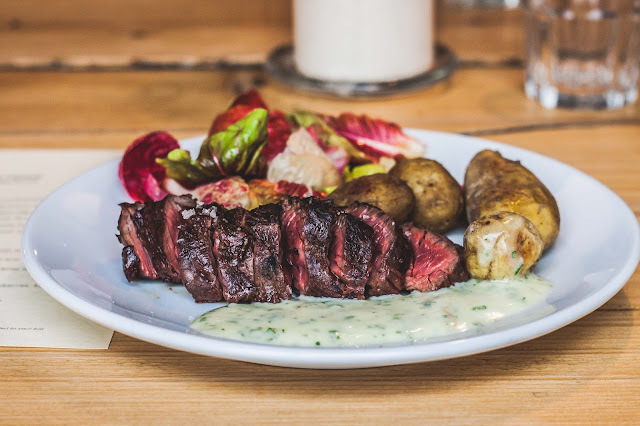 The meatiness of the picanha, chateaubriand, and "dirty steak" cuts wasn't particularly intense, but you'll want to smother everything in their excellent chimichurri anyway. The smoked short ribs were top notch - N.B. the ones pictured below are "small"! Be warned - prices rack up pretty quickly. A smarter option might be to drop by at lunch for a short rib sandwich, or on Sundays for a competitively priced roast. 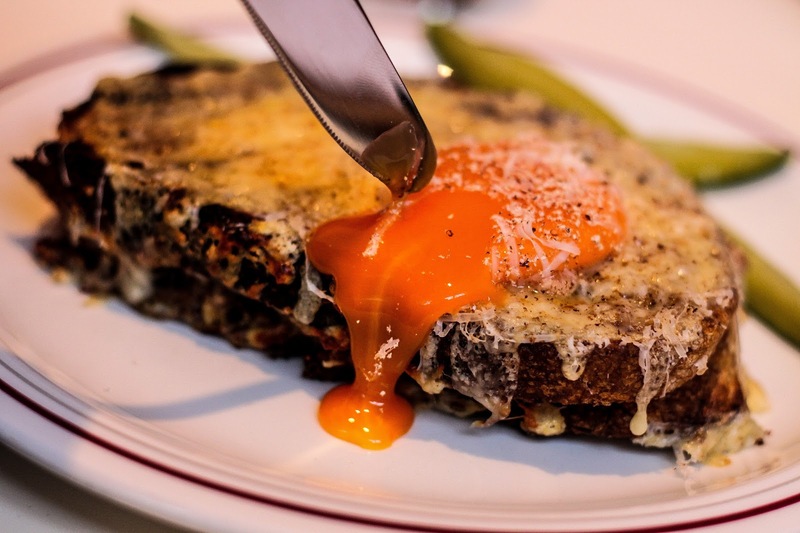 There's also good value to be found at Blacklock and Flat Iron nearby. 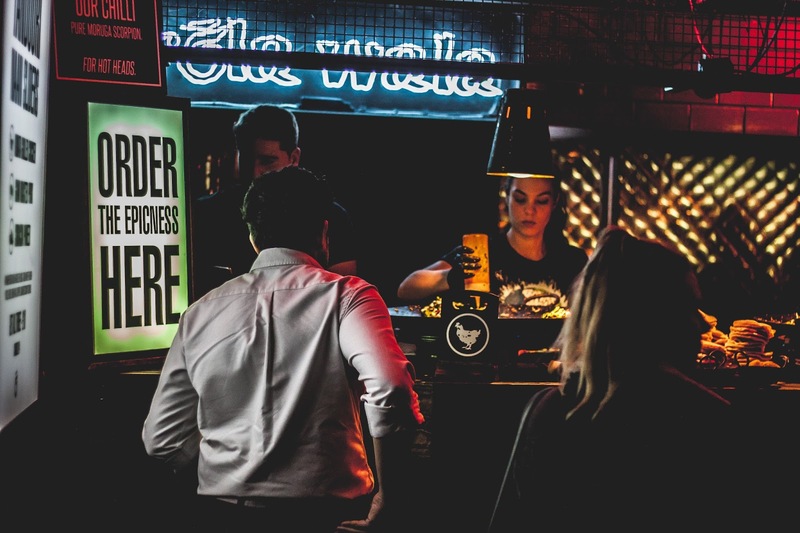 Zelman boasts an attractive bar (with some comfortable booths ideal for dining too), but if you want to move on for drinks, you aren't short of options - Milroy's, El Camion, Shotgun, Bar Termini, and The Blind Pig should be enough to get you started. 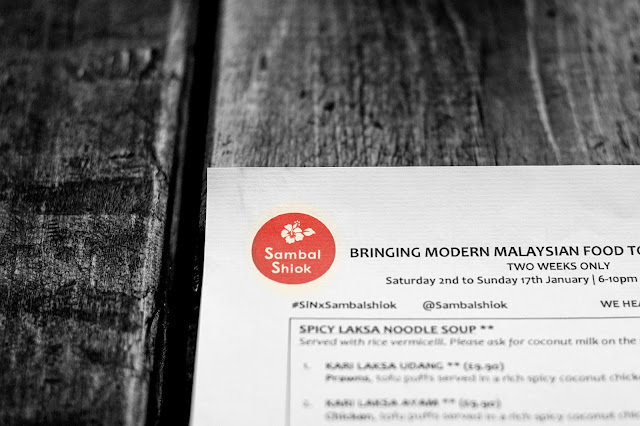 At the start of the year, modern Malaysian Mandy and her Sambal Shiok street food crew were given shelter from the cold along with the kitchen keys to Salvation in Noodles (Finsbury Park) for a few weeks. 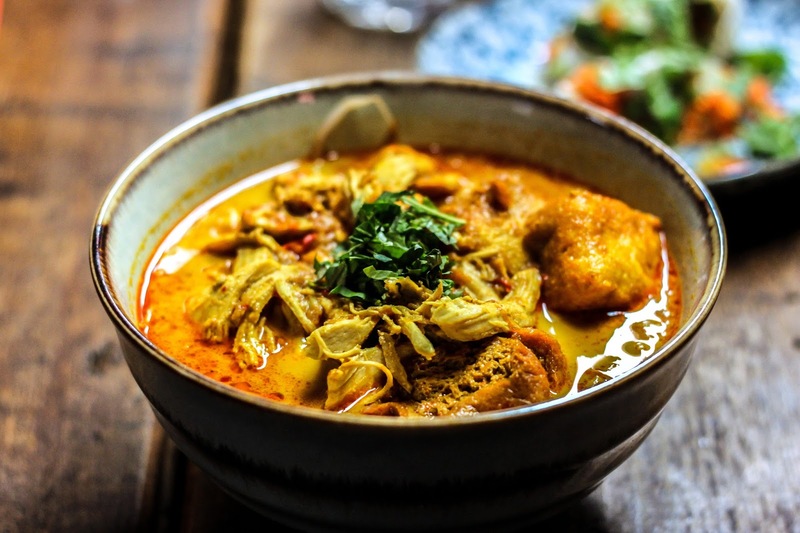 In a notoriously quiet part of the year for the food and drink scene, every Londoner with an Instagram account (myself included) seemed to be lapping up Mandy's spicy, comforting laksa bowls, and stuffing their faces with signature beef rendang and ayam goreng - crunchy lemongrass chicken poppers with an awesome peanut sauce. They have just announced their next residency - an exciting three month takeover of The Sun & 13 Cantons in Soho, starting on March 29th. N.B. The extremely popular Asma Khan and her "Darjeeling Express" train will be leaving the station on March 19th. In the meantime, you can find Sambal Shiok at Street Food Union (Fri 11am-2pm) in Soho, and the Southbank Centre Food Market (Fri-Sun from 11am). That said, check their Twitter account here for the latest info. After rocking up at Salvation in Noodles for the Malaysian Sambal Shiok popup (see above), it would have been rude not to return for their regular Vietnamese dishes. 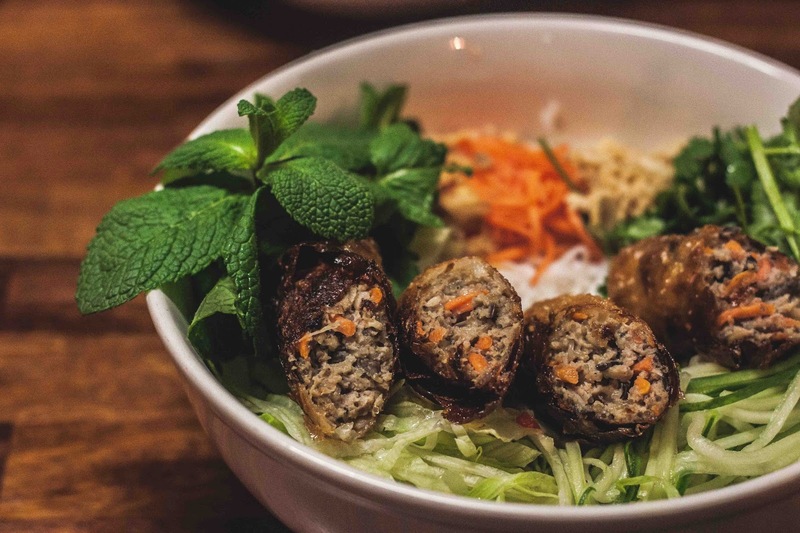 After a boozy afternoon at Beavertown Brewery's birthday party (see photos here), we were in serious need of nourishment, and owner Colin's comforting bowls of pho noodle soup and bun cha gio noodle salad hit the spot. I can also vouch for the goi cuon summer rolls, the pork and water chestnut dumplings, and the crispy phu quoc wings. Go and see them in Finsbury Park or Dalston. 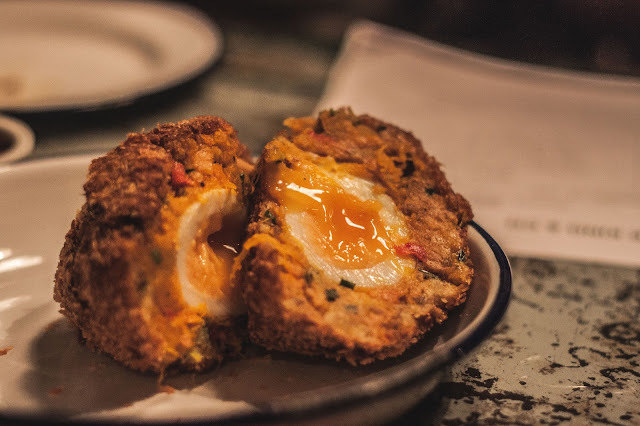 If you are quick, you can still catch the Fowl Mouths residency at The King & Co. in Clapham Common, as it's just been extended til the end of March. 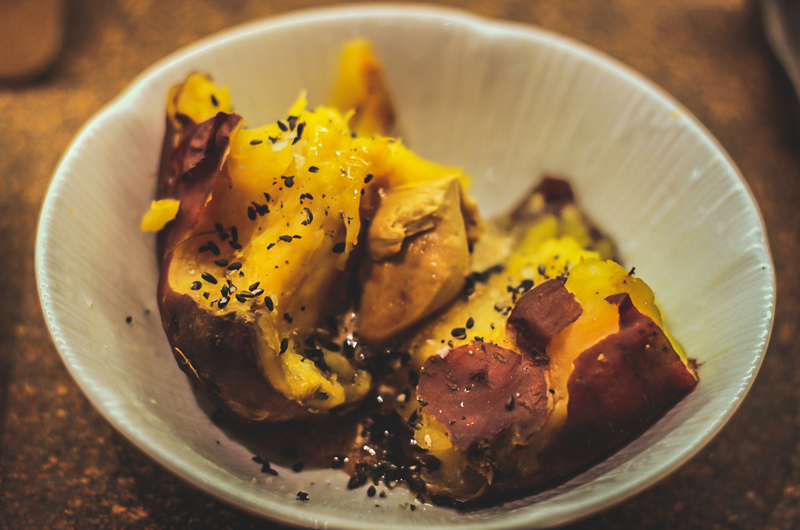 Chef Melissa has hasn't looked back since her first Japanese comfort food supper club in Feb of last year, and she's clearly been a hit in SW4. I particularly enjoyed her teriyaki chicken wings, the pumpkin korokke scotch egg, and a larger plate of marinated ponzu steak with steamed rice. The brunch specials (Sat-Sun 12-4pm) have been calling out to me from Instagram. P.S. The King & Co. beer selection is also worth sticking around for. 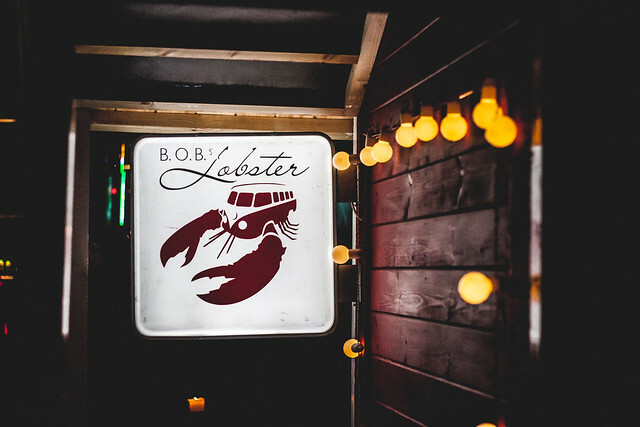 Last but not least, I finally made it to Street Feast's indoor outpost in Canada Water after hearing great things. Once again, they've turned an ordinary, empty space into something wonderful, even if it doesn't quite have Model Market's personality or Dalston Yard's atmosphere. It's open every Fri & Sat, from 5pm until midnight (£3 after 7pm, free entry before), with 14 street food traders and nine bars set over two floors to keep you busy. 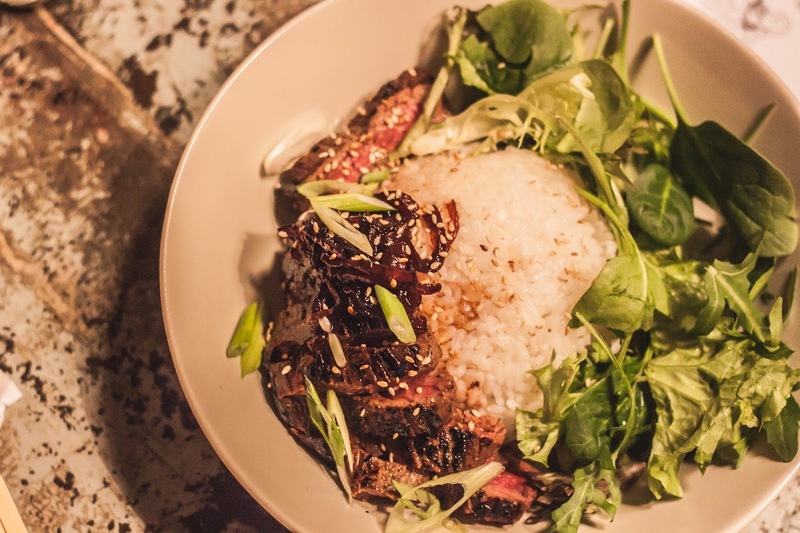 Breddos Tacos, Smokestak, Kimchinary and Prawnography are a strong place to start. On the booze front, be sure to swing by the Kamm & Sons Kitchen for a Grosvenor, and the Milk & Honey Mercury Lounge for a Penicillin, or look for The 86 bar through a secret door. On account of my bizarre work "schedule", I actually struggle to make it out for food most weekends during that magical window of opportunity, but I have managed to squeeze in a few breakfast-lunch hybrids recently. 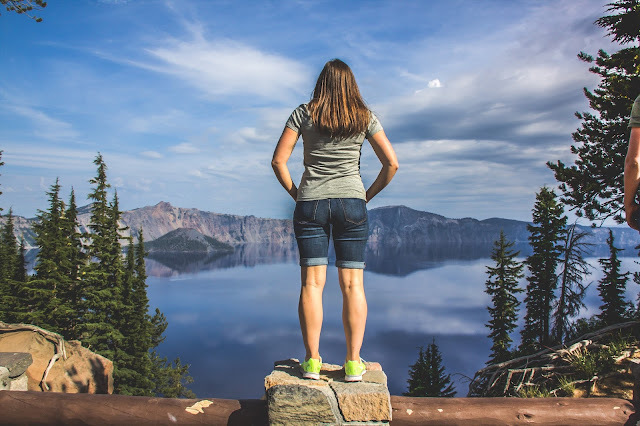 Here's some inspiration for the weekend ahead. Ready, set. BRUNCH. Surely not, right? No one takes reservations anymore. ESPECIALLY for brunch. Alright then, if you say so - see you tomorrow at 10.45 - "Isn't that still breakfast time?" (Flatmate M). And just like that, the wait for a table was gone. Five of us rocked up to the lovely Salon in Brixton's Market Row on a Saturday morning for a spot of brunch ahead of an afternoon at Beavertown Brewery's birthday party - Flickr photos here. In the evenings (Tue-Sat), Salon has a serious set menuto get stuck in to (£33/head at the time of writing) . The most recent list I saw had such delights as burata with blood orange, bitter leaves and hazelnuts and scallop with 'nduja, burnt apple, and grilled leek. 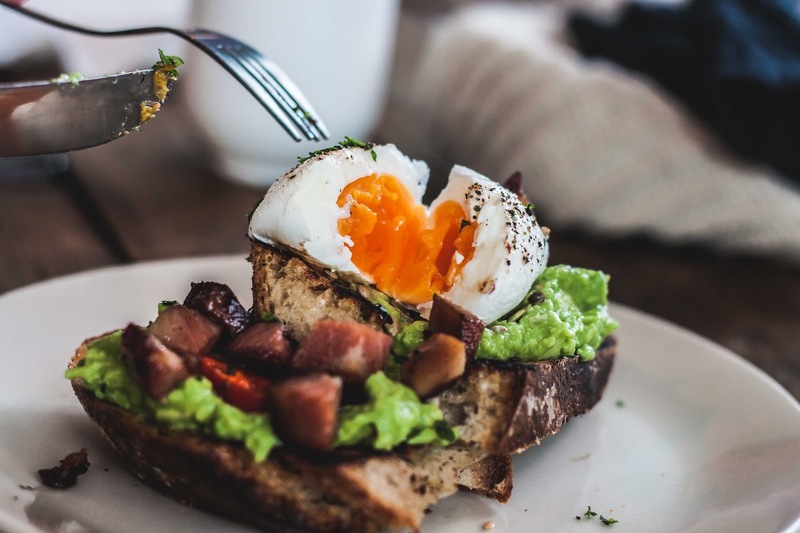 Seasonal and inventive is their thing, and this also applies to their wonderful, affordable brunch menu. We had a roomy table to ourselves, we didn't feel rushed, portions were generous, and everything was under a tenner. Bloody Marys are £5.50 compared to £15 at Duck & Waffle. What's the catch? No catch. 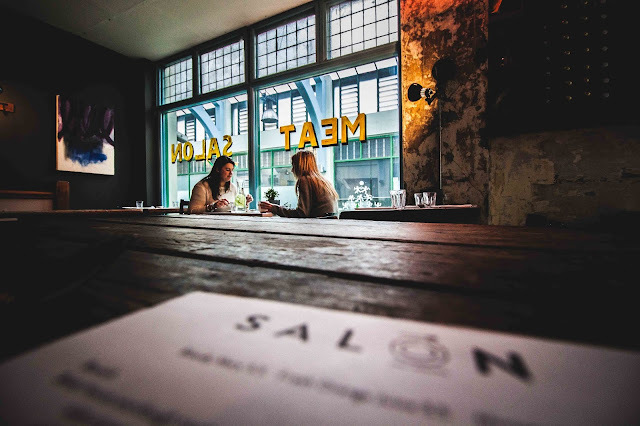 Salon is the real brunch deal. I even went back the following week for more banana bread and doughnuts. 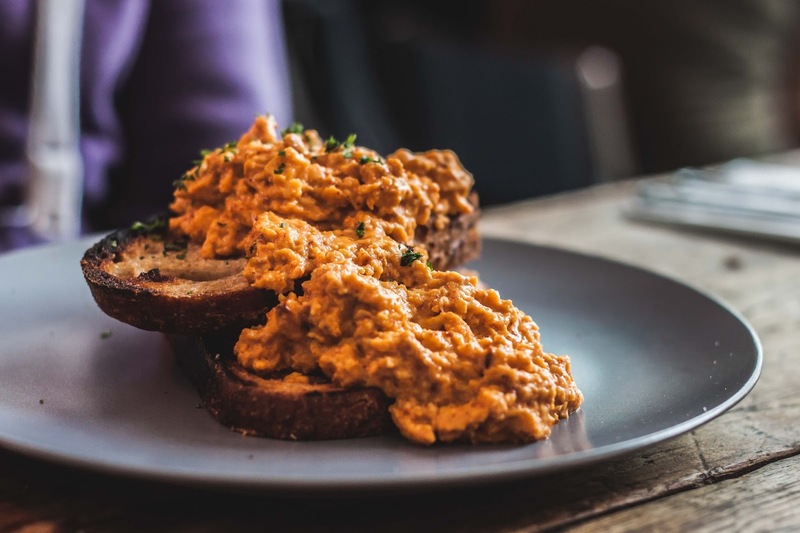 Don't miss the 'nduja scrambled eggs - they're something else. Did I mention that you can book? Call ahead on 02075019152 if you still remember how to ring people from your smartphone. Fields is a funny little place, standing all alone on Clapham Common, like the poor kid that's been left behind after team captains have chosen their players. Except that on this occasion, they foolishly overlooked Lionel Messi, for there is some magical stuff going on in this tiny kitchen from the folk behind the outrageously popular Milk in Balham (another super brunch spot). 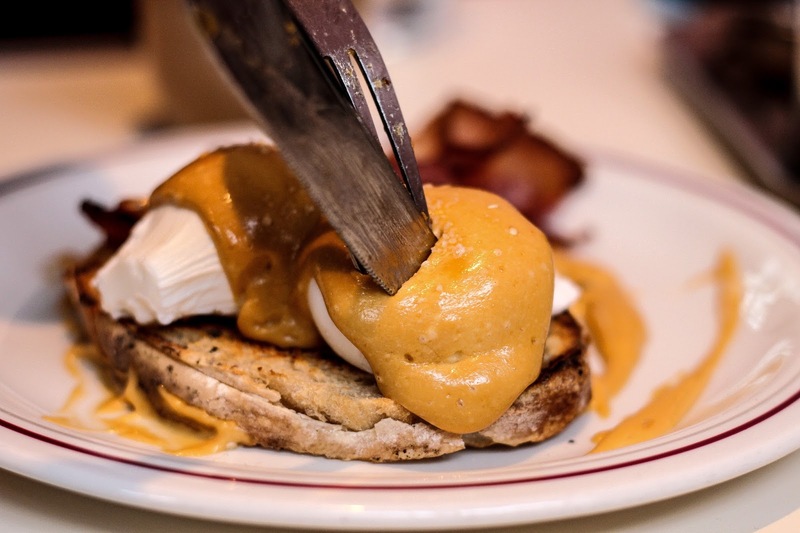 The menu is ever changing, but one dish that is always bound to be on there is their outstanding plate of poached eggs with Workshop Coffee's Cult of Done espresso hollandaise, and drycure bacon (or Hansen & Lydersen salmon) - one of the finest brunch dishes in the capital. There will also be a fair few smoked ingredients, as they do a lot of smoking on-site. Fields is currently only open Friday-Sunday, from 9am-5pm (4pm on Friday), but check the website before you go to be safe. 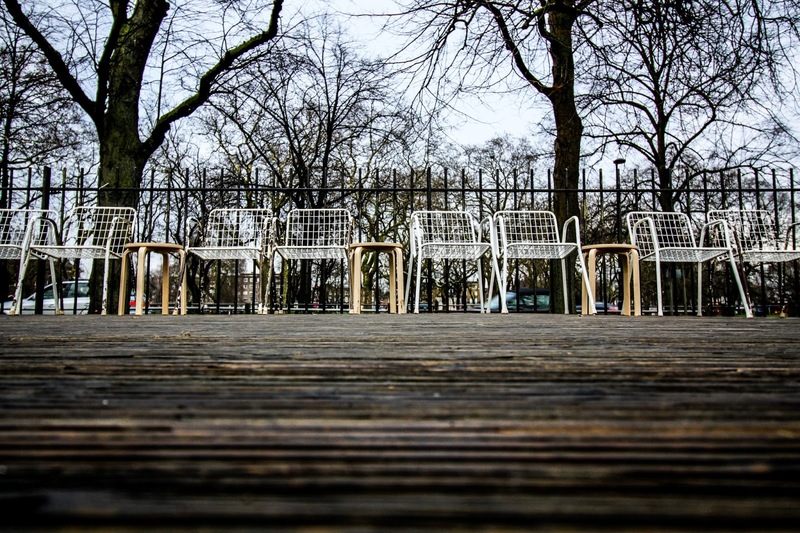 Wrap up warm, there's more space outdoors than in, and it's not the cosiest of cafés. But you'd be a fool to skip it on those grounds. 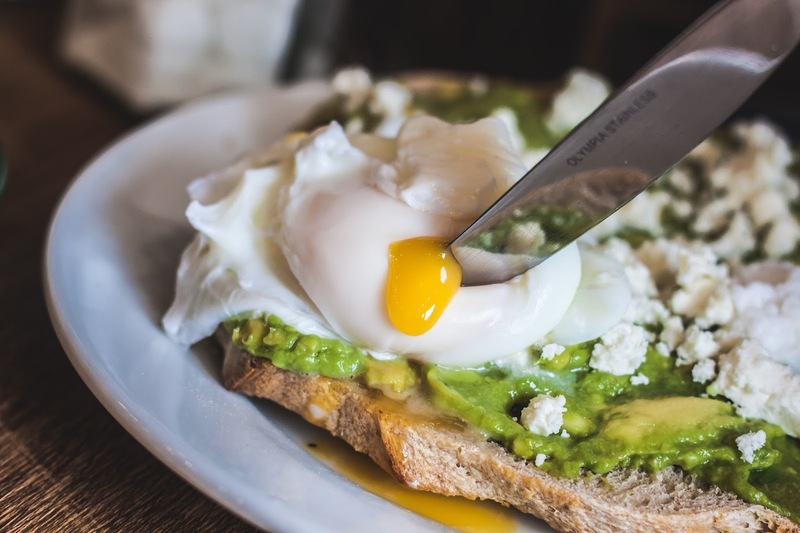 No matter what I throw at you, your ideal brunch spot is probably still the one at the end of your road, right? In my case, that's Flour To The People on Battersea Park Road, a snug sourdough bakery and brunch café with see-through toasters on every table. 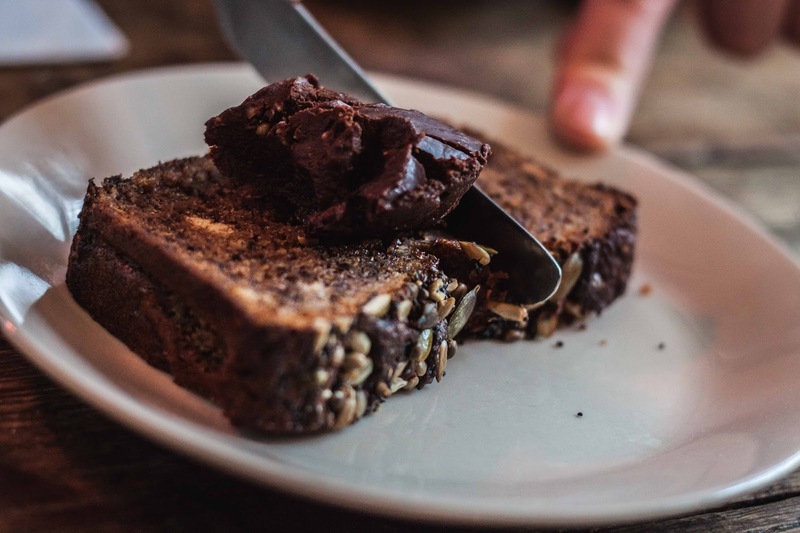 If you want your money to go a long way, order Toast To The People - for £6.95, you have access to an endless supply of freshly baked sourdough, plus two sides, and homemade spreads. 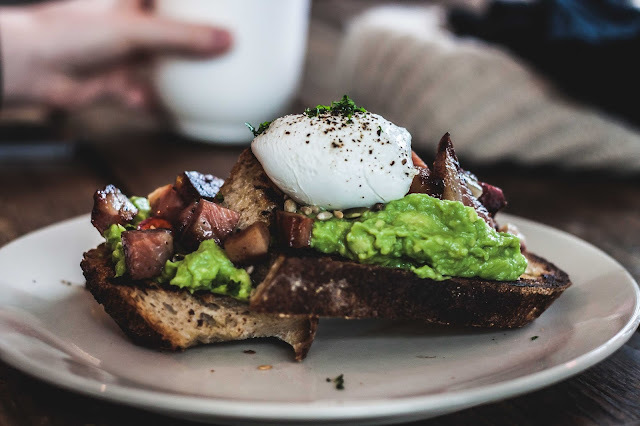 Alternatively, I can recommend the Eggs Benedict-ish that involves bacon, eggs, hollandaise and their own sourdough crumpets, and the Avo & Egg Slam - smashed avo, sweet chilli, lime, feta, and two poached eggs on sourdough. Both dishes are pictured below. 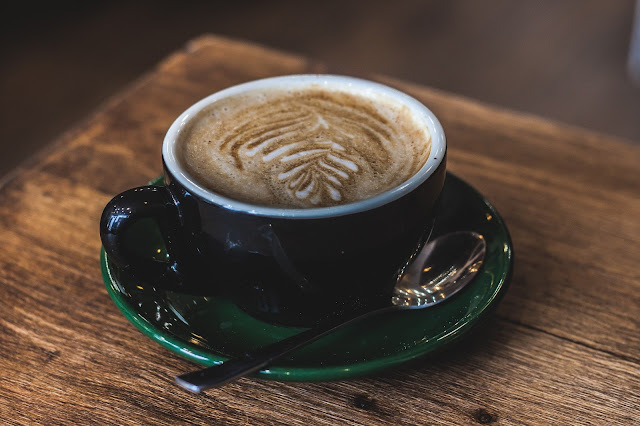 Tie it in with a visit to Park Road Kitchen, Draft House Westbridge, Battersea Flower Station, and La Moka Café to make the most of an awkward trip. Swing by Battersea Park for a round of minigolf afterwards too. If you are still in the area come the evening, Flour To The People have just started serving sourdough pizzas from 5pm-10pm. Read more here. If you want to start early, get over to Dishoom from 8am on weekdays and 9am on weekends for their bacon naan rolls and chai. 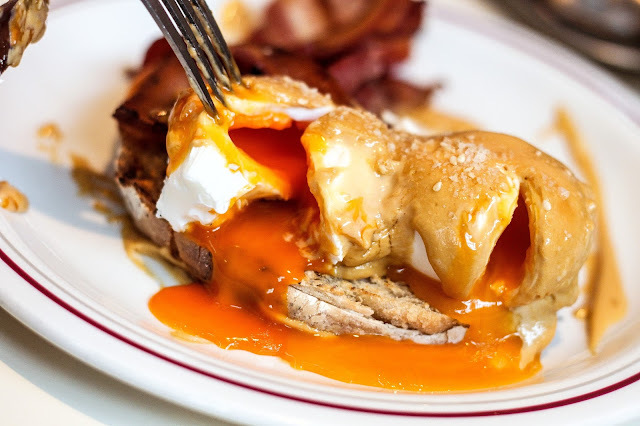 Pimlico Fresh's french toast is second to none, and they open at 7.30am on weekdays (9am on weekends). 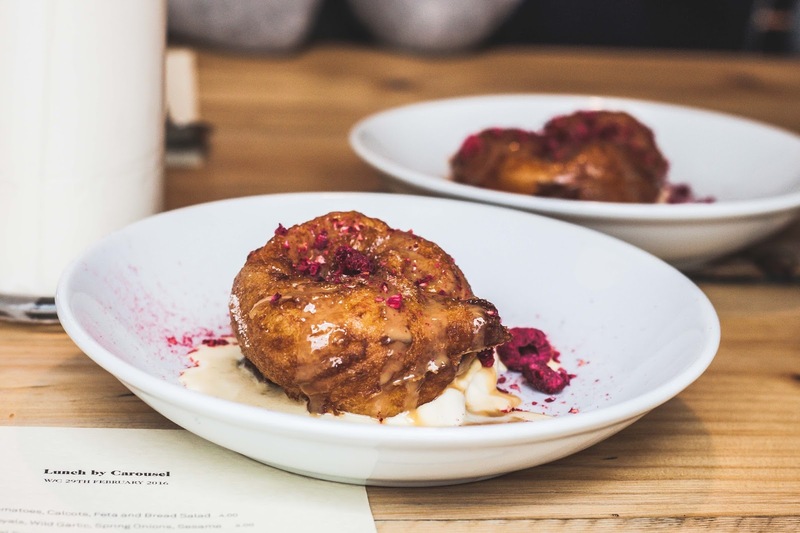 Also, Ember Yard & Dehesa in Soho have just launched an enticing breakfast menu - read more here. 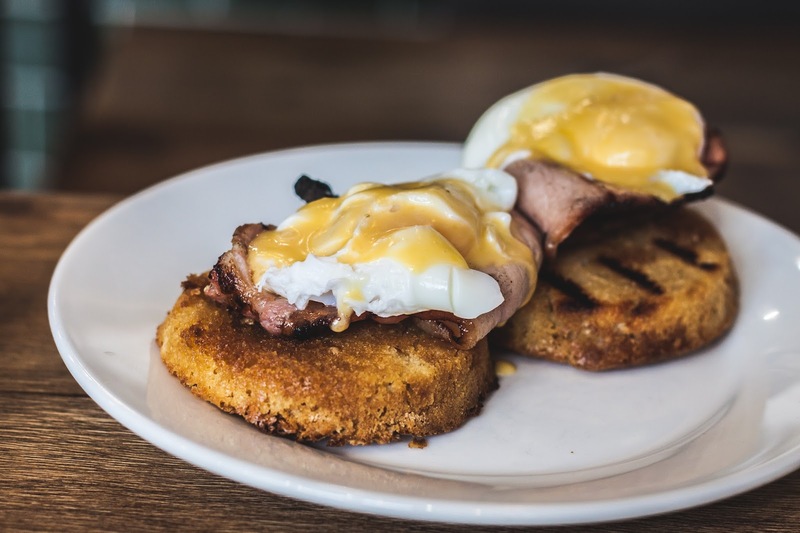 Of course, Duck and Waffle is there for you at all hours! 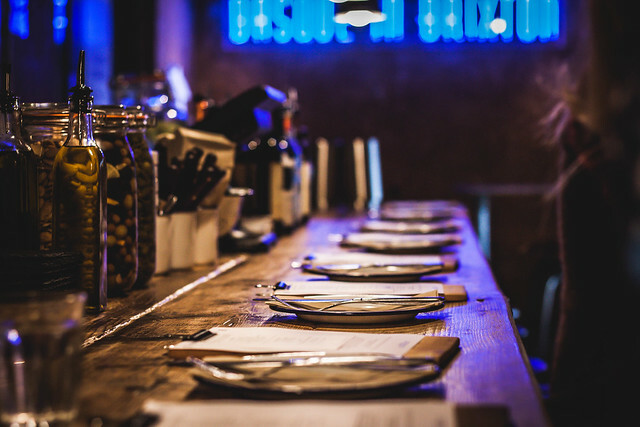 If you can make it through to 12pm, you should also get yourself over to Brunswick House in Vauxhall for their "weekend lunch", or Donostia Social Club in Pop Brixton as it opens, before the crowds descend. 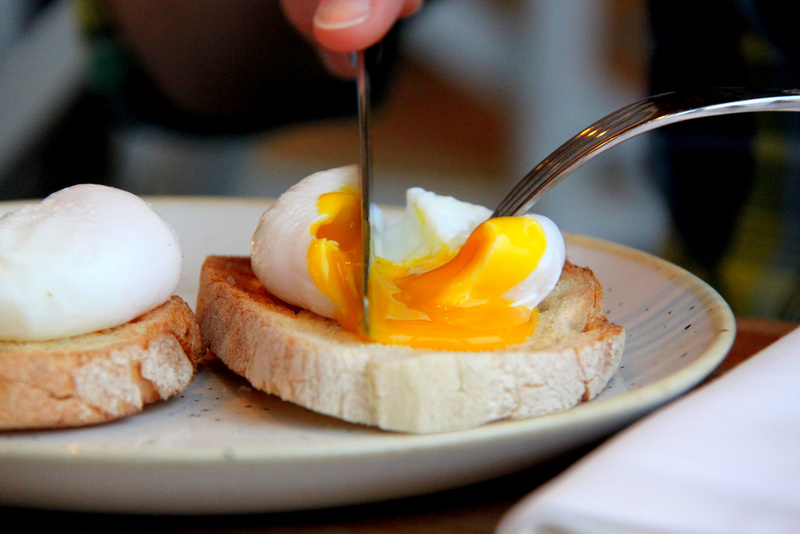 Top of my to-do list is The Good Egg in Stoke Newington. 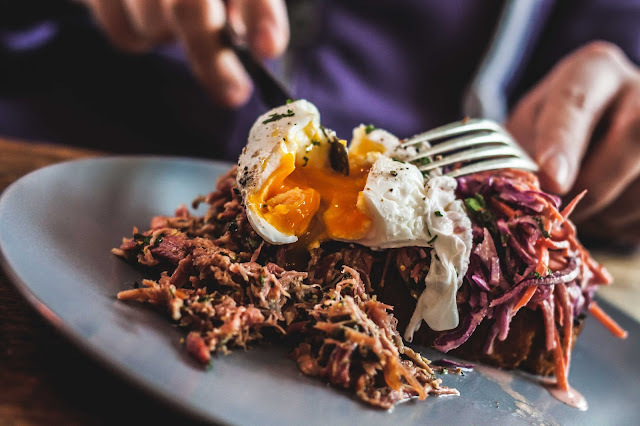 After a couple of successful years on the street food & popup scene, Joel Braham, Alex Coppard & co. successfully crowdfunded and opened an all-day Jewish soul food spot on Church Street. Pretty ashamed I haven't been in to say hello yet! 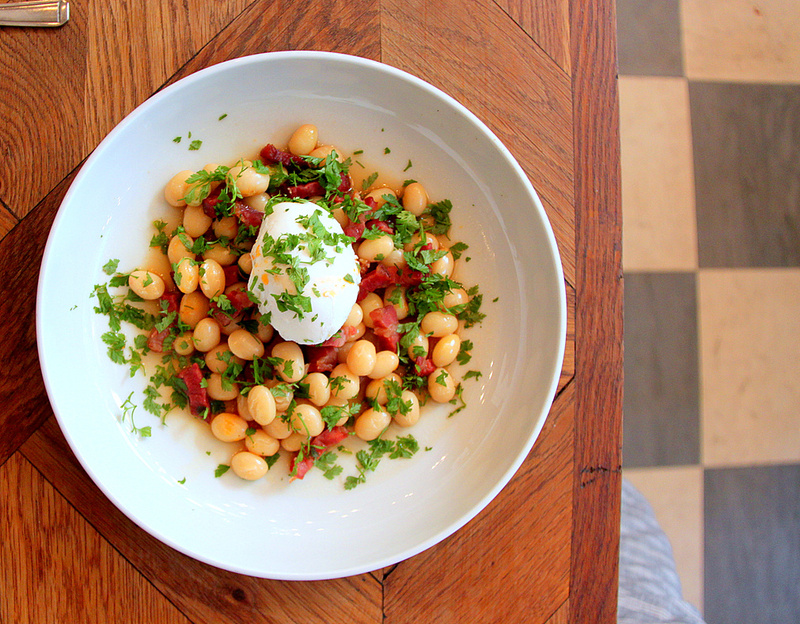 Elsewhere, exciting brunch menus have appeared at Berber & Q, The Other Room, Shotgun. 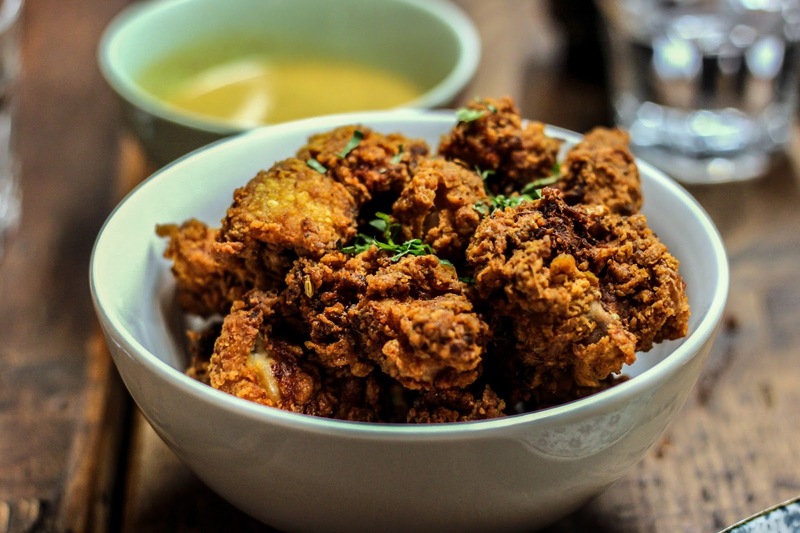 Street Kitchen London Fields, Kricket, and more. If you are more of a lie-in and Sunday roast fan, then look no further than Blacklock and Zelman Meats in Soho. Sorted. P.S. You may have noticed the word Flickr flying around. I've just started putting photos up there, and I will be updating it most days so please check it out here, and follow me if you have a Flickr account!